The 2015 edition of CounterPoint is just over a month away. Held on Memorial Day weekend at Kingston Downs in Rome, Georgia, CounterPoint is a festival featuring a three-day mix of local and nationally-recognized artists. 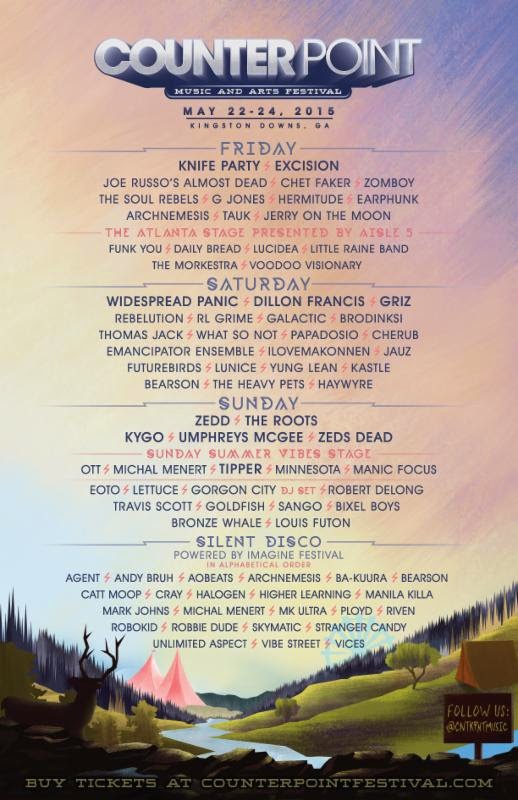 Added to the 2015 lineup are new artists including Griz, Excision, EOTO, Zomboy, G Jones, Kastle, Louis Futon, Bearson and local favorites Jerry on the Moon. To add to the excitement of the Memorial Day weekend experience, Widespread Panic, Umphrey's McGee and Papadosio will deliver a special treat for CounterPoint fans when they each perform extended 2-hour sets. A handful of local artists will get their big shot in the Midway on Friday afternoon on a special "Atlanta Stage presented by Aisle 5." The lineup features Funk You (Augusta, GA), Daily Bread (Lithonia, GA), Lucidea (Atlanta, GA), Little Raine Band (Birmingham, AL), The Morkestra (Atlanta, GA) and Voodoo Visionary (Atlanta, GA). For those looking to dance into the early morning hours, CounterPoint is teaming up with Imagine Music Festival to power the popular Silent Disco this year, boasting a lineup including highly anticipated sets from Archnemesis, Bearson, Manila Killa, Michal Menert, MK Ultra, Vibe Street and many more. 3-Day General Admission Tickets are available at a special price of $185 until 24 April 2015 before rising to their regular price. CounterPoint is produced by MCP Presents -- a national production, promotion and event management company with 12 years of festival promotion experience in the international electronic music scene. Known for producing world-class events such as: Camp Bisco Music + Arts Festival in Upstate New York; Lights All Night in Dallas, Texas; The Buku Project in New Orleans, Louisiana; and Mad Decent Block Parties. MCP also manages elements of internationally renowned events such as TomorrowWorld, Mysteryland and more.